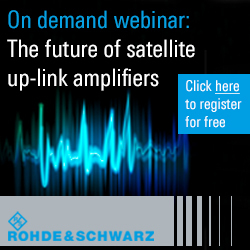 ViaSat Inc. (Nasdaq:VSAT) now encircles the globe with its Yonder(r) mobile broadband network. 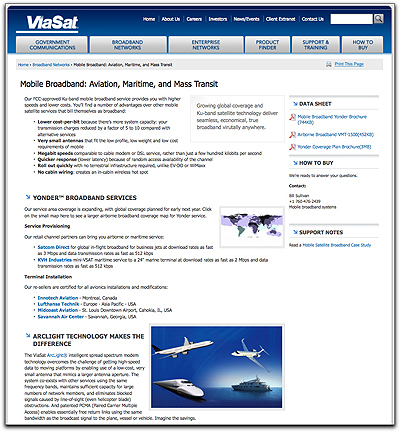 The network, which ViaSat began building in 2007 with partner KVH Industries Inc. (Nasdaq: KVHI), can connect subscribers to uninterrupted mobile broadband service around the world with coverage over the vast majority of the busiest travel corridors and air routes. The Yonder coverage became worldwide with the addition of service this month over the Indian Ocean, Guam, and the waters north of Australia. The Yonder service offers cable modem-like speeds of up to 10 Mbps downloads to the platform and up to 512 kbps uploads. Business jet customers get an “office in the sky” experience, with the ability to send and receive broadband data, connect to a virtual private network, and access video programming using portable devices or onboard TVs. Both services are powered by the latest in ViaSat patented ArcLight(r) technology, which enables a very small, lightweight antenna to deliver improved satellite communications on-the-move (COTM) performance. The mobile Ku-band satellite network uses ViaSat technology to control ten satellite transponders providing service on a near global basis. Each satellite is connected to one of eight secure terrestrial gateways around the globe, each of which has been recently upgraded with the latest advancements in network technology to optimize performance and seamless switching between satellites. The Yonder mobile network is providing broadband service to multiple customer classes operating on a simultaneous basis around the world. Applications include Internet access, VOIP, and video for private business jets; crew and passenger broadband access for commercial and private maritime vessels through the KVH mini-VSAT Broadband(sm) service; maritime security operations by the U.S. Coast Guard; and real time video feeds from ISR aircraft.